Waitomo is famous for one thing: worms. And not just any ol’ worms but glow worms! 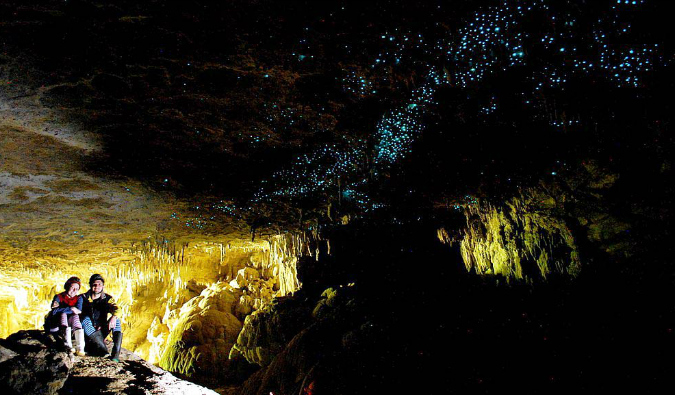 Every year thousands of travelers come here to see the famous glow worms that line the ceilings of the nearby caves. The interesting thing about the glow worms is that they aren’t really worms at all. They’re actually fly larvae that emit a phosphorescent glow that shines from the inside of the caves like a starry night, lighting up the ceiling. So, why do they glow if they’re not glow worms? Well, it’s actually their waste and snot that glows. The larvae developed this glow to attract prey into their sticky threads by making the prey believe they’re outdoors. Since the cave ceiling looks like a starry night, the prey will try to fly upwards and end up stuck in the larvae strands. The hungry larvae will then devour their prey. While glowing fly larvae may not sound like an amazing activity, as you can see from the photos it’s still incredibly captivating and beautiful. The caves were discovered in the late 19th century by a local Maori chief. 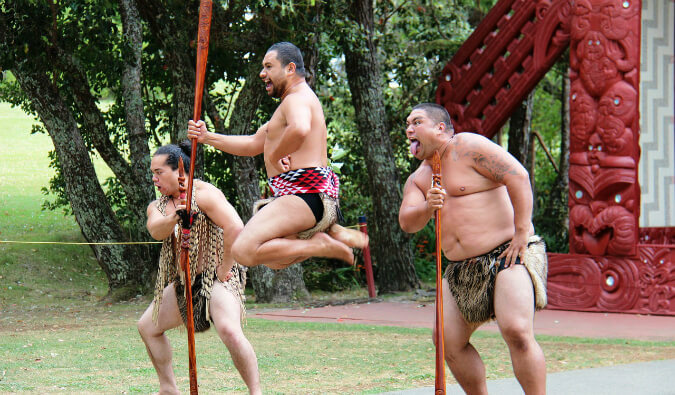 They were opened to the public shortly thereafter, with local Maori acting as guides. While the caves were taken over by the government for many years, they were eventually returned to the Maori. In fact, many of the present-day workers are descendants of the original founders of the caves. The Ruakuri cave, in particular, has significant links to the spiritual traditions of the Maori. These days, over half a million people visit the caves every year. A huge industry has built up to help people visit the Waitomo glow worm caves, with plenty of options available depending on what you’re looking to do. There’s the three-hour black-water tubing trip, the five-hour trip that includes abseiling and climbing, or if you like it easy, a boat through a bigger cave. Waking up early in the morning, my group headed out to the cold waters of Ruakuri cave. We wetsuited up and practiced jumping into the inner tubes we would ride through the caves. I wasn’t happy that I had to jump off not one, but two small waterfalls. Worse yet, this had to be done backward so I could land in my tube. The waterfalls are only a meter or two high, but I really hate heights. Yet at that moment, realizing a wetsuit doesn’t keep you dry but simply wet, I found something I hated even more. After our practice jump, we, a crowd of 12 wet-suit-wearing, boot-wearing, helmet-wearing backpackers, marched gingerly towards our destination. After a short walk in the woods, we entered the glow worms’ dominion and were given a quick tutorial about how the next few hours would go. Sadly, it felt like the tutorial lasted longer than the trip—away from the light, surrounded by darkness and the rushing chill of the water, the hours seemed to pass by in minutes. Just as I was adjusting to the experience, the end of the tunnel came and we were topside again. But the experience in between was amazing. After our instructions, we began to descend into the cave. We walked through tight openings and tunnels and waded through quick-moving and very cold water. Sometimes the water was ankle deep, other times chest height. Eventually, we came to the first milestone: waterfall #1. I met the waterfall with trepidation. My group, knowing my fear, encouraged me to go first, but that wasn’t going to happen. I went third. My fear was that I’d never jump far enough to clear the rocks. I didn’t jump far enough. As my tube landed in the water, my foot lightly touched the bottom rock. From there, it’s an easy cruise through the cave, where above you, you begin to see glow worms like stars in the sky. They seemed limitless in number. It reminded me of my childhood when I used to put those glow-in-the-dark cosmos stickers on my ceiling and stare at them as they lit up my room. But the day’s biggest challenge lay ahead: waterfall #2. This waterfall was much higher than the first, and to me, it might as well have been Niagara Falls. I had to make everyone count twice before I was ready to jump. Closing my eyes, I jumped, and this time I jumped far enough. But I hated every minute of it. I still prefer to have my feet on the ground. Yet from here until the end it was smooth sailing…or tubing in this case. The rest of the way was all glow worms. Leaning back in my tube, I floated down the river, marveling at the beauty of the light show and the tranquility of my surroundings. But the tunnel’s end came too quickly, and I was left wanting to go back and stare upwards just a bit longer. I can see why the glow worm caves are one of New Zealand’s biggest tourist attractions. They’re beautiful. The caves are peaceful. Overall, it’s an amazing experience. Three hours seemed too short, but five hours might have been a bit too long. I’d go back to see the glow worms again, and, whether you abseil, tube, or simply cruise in a boat, the glow worms are not to be missed. Waitomo is 200km south of Auckland. By car, it’s around a two and a half hour drive, while by bus it’s closer to 3 hours. Expect to pay around 35 NZD for a one-way bus ticket from Auckland. A bus from Rotorua will cost around 35 NZD each way. Prices will vary depending on the company and time of year but, generally, water tubing is 145 NZD per person, tubing and abseiling is 250 NZD per person, and a simple boat ride is 51 NZD per person. While the glowworm caves in Waitamo are not a cheap activity, they are definitely one you should make an effort to do. You won’t regret it! Find a cheap flight to Waitomo by using Skyscanner or Momondo. They are my two favorite search engines. Start with Momondo. 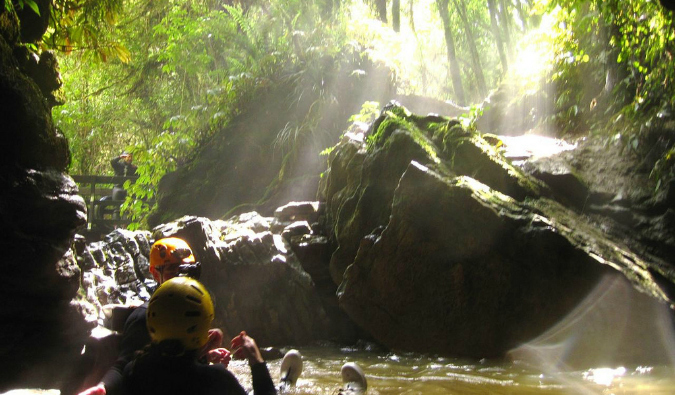 Want More Information on Waitomo? Wow looks amazing! 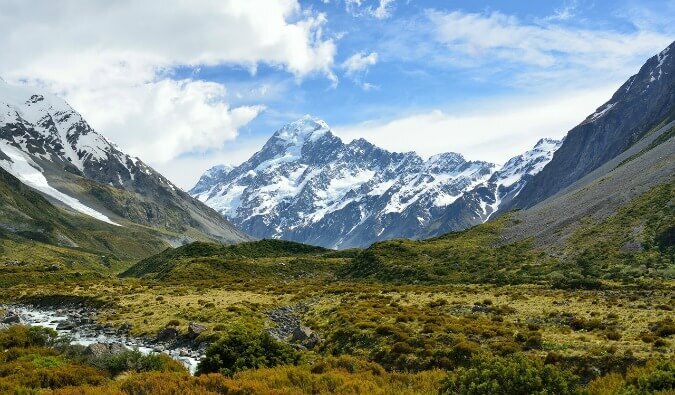 Another neat idea to add to the New Zealand bucket list. Geez, that photos is gorgeous. I’ll definitely have to make the trip when I arrive in New Zealand mid-February. Do they have seasons where the glow worms are particularly beautiful and numerous, or is it all year round? It’s year round but the water is A LOT colder during the New Zealand winter. I did this back in the spring with the same company and LOVED it. Though I was there in NZ’s fall, so it was only about 60 degrees out, the water temp a bit less, and I was FREEZING by the end of the five hours. Thanks so much for this story and pics — you motivated and reminded me to put Glow Worms back on our itinerary as we travel the South Island. We’ll detour to see them either on the West Coast (by Charleston) or down at the southern end at Te Anau. 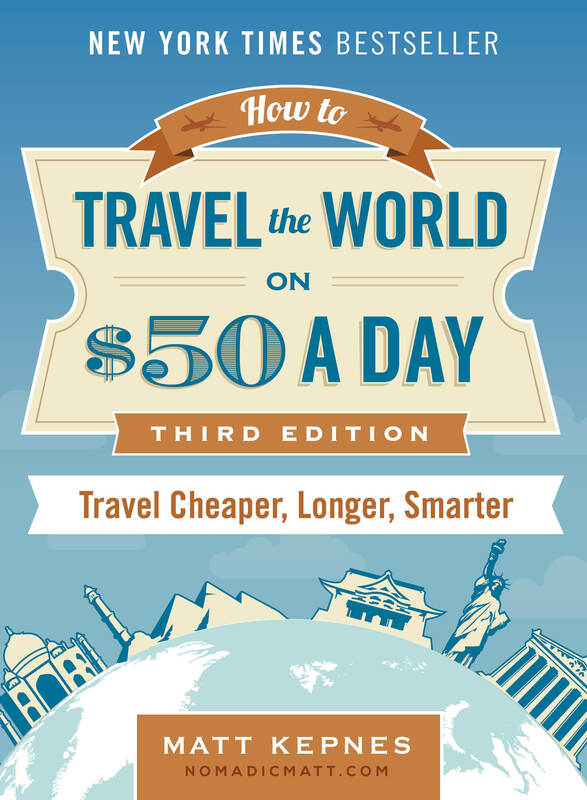 Matt or other readers — can you recommend any tour operator that offers a kid-friendly version of this type of tour? (My kids are ages 8 and 11.) Also, does anyone know how the West Coast caves compare to Te Anau down south? 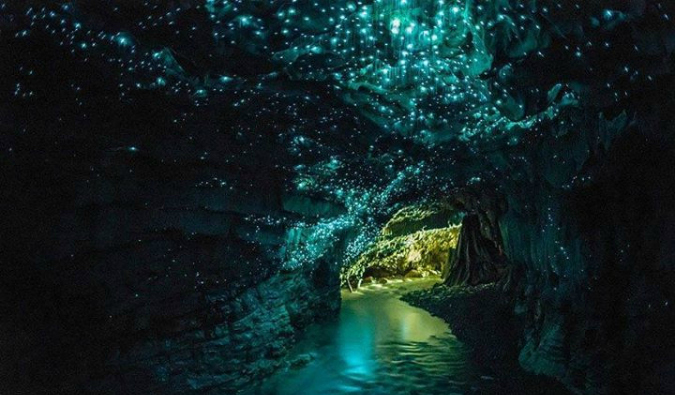 Hi Sarah – I have done the glow worm caves in Charleston and Te Anau and I think Charleston is better. Charleston you have the option of tubing or walking in – I did the walk and there were kids around that age and they seemed to do fine. The Te Anau caves are still worth a look as the boat trip across Lake Te Anau is cool, I just found the Charleston caves a bit more natural where the Te Anau caves have had walkways put all through them which detracts a little from the experience. I can’t remember what the company was 🙁 but we booked at the Information Centre in Westport. Definitely something to look forward to when I finally decide to go to Australia / New Zealand (when my kids are older and can appreciate more…). Thanks for sharing! Will Stumble this and bookmark! Hope you had a great holiday season!! I did this with the same company a year ago in November 2008!! Such an amazing experience! Definitely a must do and like at every place if you pay a few extra bucks you can get some great pics of your adventure! Looks awesome mate. I can see how 3 hours can go by so fast, defiantly going on my to do list for NZ. Thos glow-worms look worth overcoming your fears for – I wondered how you got those photos while juggling with the tubes and the waterfalls – did you have a waterproof camera? The guides have cameras. They take the photos for you. We did the Waitomo Glow Worm caves too, and loved it but, instead of doing the blackwater rafting, we did the Sounds of Silence rafting tour. It was a less adventurous option but we felt like we got very close to the glowworms and experienced them more in depth than on a rafting adventure. Either way, it’s an amazing site and next time we go to New Zealand, we will try the blackwater rafting version. Wow, sounds like an amazing experience. I am with you, I hate jumping into thin air. I am not good with it. Dave loves it and doesn’t get stressed about it at all. I can’t understand not having that fear, because for me, I get butterflies. I hate the feeling of falling. But it definitely looked worth it, so when we make it to New Zealand, we will be checking out the glow worms for sure. Thanks for the photos and write-up. First time I’m hearing (reading) about this! Definitely something to check out during our NZ adventure – soon. We’re planning a one year trip soon and NZ’s on the list! agree that the 5 hour trip was slightly too long (i was fine until the 4.5 hour mark and the last 30 min were misrable…) but i am still super glad i did it over the 3 hr trip. i am not scared of heights, but force of habit, i screamed bloody murder when i jumped so i can relate, sort of! and the screaming sounds even worse in the cave!!! If somebody wants to see only glow warms there are other caves (and it is free) in New Zealand. One place I remmeber is Punakaiki Cavern close to famous pancake rocks in South Island. Can you tell us more about the free options? 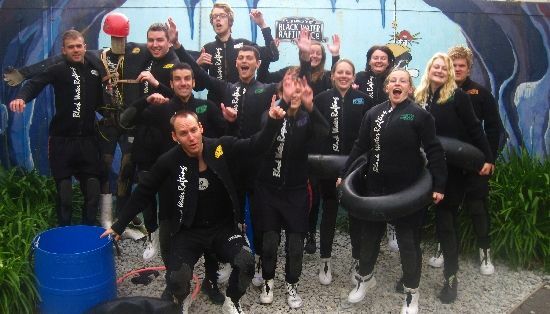 Great write up of black water rafting, brings up a good memory. I did it as well in February this year. Totally love it! Jumping over the falls was really scary for me at first, I rely entirely on the guide guy pushing my chest, as I jump very weakly. Just like you, I touched the rocks (I think by my bum, that close to the rock..) The later on jumps, I was less scared even though still pretty much rely on them pushing me. Want to compare to my experience? Have you tried going to the Ruakuri Natural Tunnel Walk at night? You will see a glorious display of glow worms for free. Torches are essential. John, have you written about this somewhere? Can you tell me more? I skipped the waitomo caves due to the price. There are a lot of caves in NZ that are open to the public, completely undeveloped and also contain glow worms while beeing free. The Abbey caves in Whangarei (2h north of auckland) are such caves. You will get wet feet in there and have to be careful because there is a lot climbing involved, often over slippery and sharp edged limestone, but it is totally worth it! I was there around march 2015 and there wasn’t a soul around.